A holiday to a US marine park was a "dream come true" for nearly 200 seriously ill and disabled children from the UK. Armed with a team of doctors, nurses, physios and other escorts, the children were taken on the 27th annual Dreamflight charity holiday. The end of the adventure saw them swim with dolphins in the waters of SeaWorld in Orlando, Florida. But before the 192 children embarked on their holiday, organisers will have arranged pre-existing medical travel insurance for added peace of mind. Away from their families for around a week, the children are said to have greatly enjoyed the experience of being in the water with the much-loved marine mammals, described as the highlight of their week in the Sunshine State. Fourteen-year-old Nicole Lewis, from Wirral in Merseyside, said swimming with the dolphins was a dream come true and that the place is "like paradise", and admitted she will find it difficult to relay to her parents just how much she enjoyed the holiday once she has returned home. "I never knew dolphins were so clever," she said. "I don't think I'll be able to put it down in words." One of the holiday escorts, gardening celebrity Charlie Dimmock, said: "I have to say that swimming with the dolphins ... all the children, it's what they're building up to so it's great that we do it at the end of the holiday. "For us adults watching, because we've got to know the children well over the time, it's always a bit teary. "We always wear sunglasses so nobody can see us welling up because they just do love it so much." The trip gives the children "a lot of confidence and independence", she added. 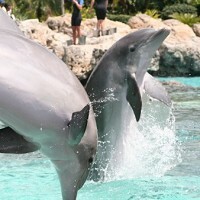 SeaWorld Orlando hosts millions of customers a year and is said to be among the most-visited amusement parks in the US. Dreamflight is a registered UK charity which takes seriously ill and disabled children, without their parents, on holiday to Orlando.